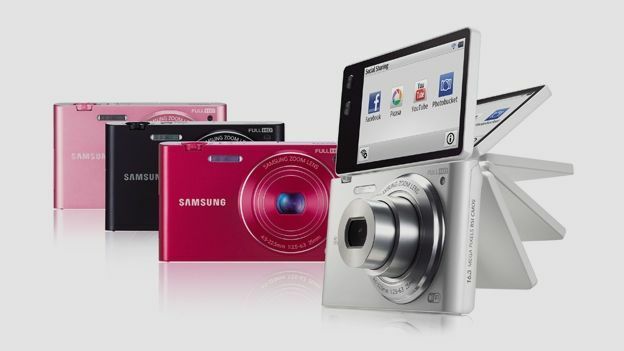 This is Samsung's latest addition to its range of Wi-Fi enabled SMART snappers – the MV900F. The touchscreen camera is the follow-up to the company's popular MV800, and features Wi-Fi functionality, which allows users to instantly connect to social media sites, such as Facebook and Twitter, to share snaps with their family and friends. Users can also transfer files wirelessly to their mobile devices and save data to cloud services. The MV900F features, amongst other things, a F2.5 bright lens with x5 optical zoom and a 16.3-megapixel BSI CMOS sensor for razor-sharp snaps, claims Samsung. Also in the mix is a 25mm lens and a 180 degree flip-out 3.3-inch WVGA AMOLED touch display that's ideal for capturing self-portraits, as well as a Low Light Shot mode which automatically adjusts the device's light settings. There is also 1920x1080 Full HD video recording on board for video hogs. Samsung's Gesture Shot function uses motion-sensor technology so that users can control the snapper remotely, using just a series of gestures. For example, a user would simply need to make a circular motion with their hands to control the camera's zoom functions. The MV900F comes in a myriad of colours including white, pink, black and red. The MV900F will be available for purchase in mid-August, priced at £329.99.